1. The Philippines is the world's leading producer of coconuts, having produced 19.5 million tons of the fruit in 2010. 2. According to the 2000 census, 52 million people in the Philippines speak English, making it the fifth largest English-speaking nation behind the U.S., India, Pakistan, and the U.K.
3. Of the top 10 largest shopping malls in the world, three are found in the Philippines: SM Megamall, SM North Edsa, and SM Mall of Asia. 4. The Puerto Princesa Subterranean River in Palawan is 8.2 kilometers long. Until the discovery of a 10-kilometer underground river in Mexico, the Puerto Princesa River was the longest subterranean waterway in the world. 5. Ferdinand Magellan arrived in the Philippines in 1521, marking the start of the archipelago's colonization under Spanish rule, a 377-year period that lasted until 1898. 6. The islands were dubbed "the Philippines" after King Philip II of Spain. 7. As a result of the Spanish influence, the country is predominantly Christian with 90% of the population practicing some mode of Christianity, the vast majority being Roman Catholic. 8. The world's largest Christmas lantern was illuminated in San Fernando, Pampanga on Dec. 24, 2002. The structure was 26.8 meters in diameter and cost five million Philippine pesos. 9. Pope John Paul II offered a mass to about five million Filipinos on Jan. 18, 1995, at Luneta Park in Manila. The event went into the Guinness Book of World Records as the Biggest Papal Crowd at the time. 10. In 2009, about 1.39 billion SMS messages were being sent in the Philippines daily. The country was one of the earliest adopters of text messaging, earning the moniker "text capital of the world" from the mid '90s to the early 2000s. 12. The word entered the North American vernacular in the 1940s, just as the Philippines became involved in the Second World War. 13. Taal Volcano in Talisay, Batangas, is one of the world's 17 Decade Volcanoes — volcanoes that need to be looked after given their active state and explosive history. It's also located in a lake, and has a lake inside it, with an even smaller island in it! 14. The amount of sulfur dioxide expelled by Mount Pinatubo during its eruption on Jun. 15, 1991, created a two-year haze of sulfuric acid all over the world. It caused global temperatures to drop by 0.5 °C (0.9 °F). 15. A Filipino named Roberto del Rosario made the karaoke machine in 1975, but a Japanese musician invented it four years earlier. Del Rosario, however, was the first to patent the product, which makes him the first patented producer of the karaoke. 16. In the province of Camiguin, there are more volcanos (seven) than towns (five). There hasn't been an eruption since the mid 1950s, but the island has the most number of volcanoes per square kilometer in the world. 17. 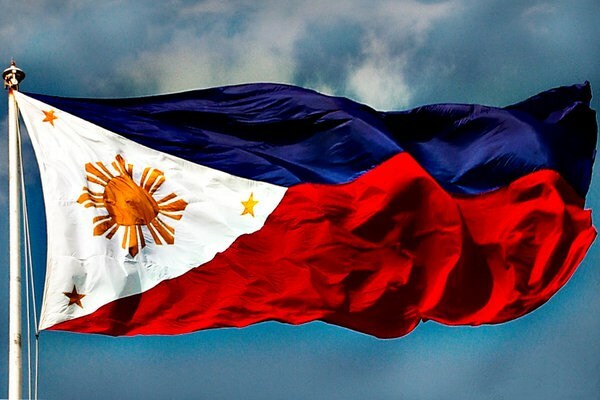 The positioning of the Philippine flag's colors indicate a message. If it is flown with the red stripe on top, the nation is in a state of war. Otherwise, during peacetime, the blue is on top. 18. The modern yo-yo takes its name from a word in the Philippine language Ilocano, yóyo. 19. The University of San Carlos in Cebu City was founded by Spanish Jesuits in 1595, making it the oldest school in the Philippines. 20. Then in 1611, the University of Santo Tomas (or, lovingly, "Usté") was founded in Manila by the Dominican Order. It is the world's largest Catholic university in terms of population. Both it and University of San Carlos are older than Harvard, which was not founded until 1636. 21. The cone of the sea snail Conus gloriamaris is a highly valued collector's item, the first examples of which were found in the Philippines and sold at auction for upwards of $5,000. 22. In 2002, the world's biggest pair of shoes were made in Marikina City. The wingtips clock in at about 5.3 meters in length, 2.4 meters in width, and almost 2 meters in height. They cost two million Philippine pesos. 25. The Philippines has won at least eight major international beauty pageant titles: two for Miss Universe; five for Miss International; and at least one for Miss World, the current titleholder being Megan Young. 26. About 25 years before the first book was printed in the United States, the Tagala, the first Filipino-Spanish dictionary, was printed in 1613. 27. After the Second World War, the Philippine jeepney was born out of the G.I. Jeeps American soldiers brought to the country in the 1940s. It's Pinoy upcycling! 28. The Philippines' approximately 300,000 square kilometers (115,831 sq mi.) of land area are spread over 7,107 islands. 29. This gives the country 36,289 kilometers (22,549 mi.) of coastline and puts the Philippines at fifth place for the longest discontinuous coastline in the world. 30. Depending on the method of classification, there are 125 to 170 languages in use in the Philippines, such as Tagalog, Cebuano, Ilocano, Hiligaynon, Bicolano, Waray, and Kapampangan. 31. The Philippines welcomed its 100-millionth citizen on July 27, 2014, making the country the seventh most populated country in Asia and the 12th in the world.